A brilliant debut mystery in a classic vein: Detective Cormoran Strike investigates a supermodel's suicide. After losing his leg to a land mine in Afghanistan, Cormoran Strike is barely scraping by as a private investigator. Strike is down to one client, and creditors are calling. He has also just broken up with his longtime girlfriend and is living in his office. Then John Bristow walks through his door with an amazing story: His sister, thelegendary supermodel Lula Landry, known to her friends as the Cuckoo, famously fell to her death a few months earlier. The police ruled it a suicide, but John refuses to believe that. The case plunges Strike into the world of multimillionaire beauties, rock-star boyfriends, and desperate designers, and it introduces him to every variety of pleasure, enticement, seduction, and delusion known to man. You may think you know detectives, but you've never met one quite like Strike. You may think you know about the wealthy and famous, but you've never seen them under an investigation like this. I've never heard about this one until it became a trending topic on Yahoo!. Apparently, Robert Galbraith was just a pseudonym used by a really famous author because she wanted to experience publishing a book without all the expectations from the fans. Do you have any idea who this author is? She's really famous and her books were adopted into movies and are holding box office records of all time. Back to the book, it's a breath of fresh air to be reading a different genre written by one of my favorite authors. 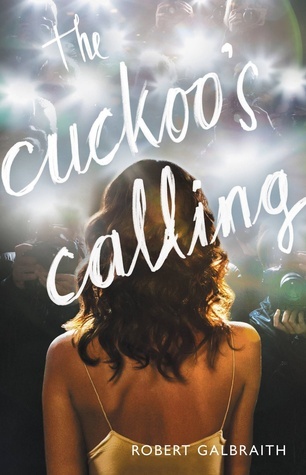 So Cuckoo's Calling is obviously a detective novel which stars the war veteran, Cormoran Strike, who was commissioned by John Bristow to investigate his Lula Landry's death. I decided to play Sherlock too and came up with suspects. I had several people who do have a motive to kill Lula. JOHN BRISTOW - He's Lula's eldest brother who works in their family's company. He takes care of her contracts, the latest of which is a deal from Guy Some, and makes sure to get her the best deals. He might be motivated to kill her because his trust and salary don't meet up with how much Lula is earning. They were all adopted so it might be because he was jealous of the attention Lula gets. GUY SOME - A thin black man who is a fashion designer and whom Lula considers as her brother. He commissioned Lula to model his latest collection and Lula signed a contract with him worth 5 million dollars. What better advert motive does he have other than as a profit to his business. It was found out that the dress Lula was wearing when she died sold out in the 24 hours after her death. It was said that Some, told the press that she was wearing his dress. DERRICK WILSON - He's the security guard on duty the night of the incident. He disappeared a quarter of an hour with the alibi that he felt unwell and so he went to the bathroom. For all I know, he might be at the scene of the crime during that period, busy killing Lula. FREDDIE BESTIGUI - He's a film producer who has the hots for Lula. He seemed to be enamored by Lula and he had offered to produce her a movie countless of times. Motive: Well, he might have propositioned Lula and when she didn't agree, he got mad, and accidentally pushed her in the balcony. TONY LANDRY - He's Lula's uncle, the brother of her adoptive mother. From the very start, he has eagerly shown his disgust towards her specially when Lula got involved in various scandals. Might be that he wanted to protect the image of the family and got sick of Lula's antics that's why he decided to just end her. EVAN DUFFIELD - He's Lula's on-and-off boyfriend. They got into a fight the night of the incident. He followed her home 15 minutes after she stormed out of the bar. But he went the other way when he saw the paparazzis at her residence. Could it be that he used that and Ciara Porter as alibi to hide the truth? So one among the suspects listed above is the real killer. I won't give you any more details. You have to find it on your own. What I love about this book is that I felt like I was listening to a storyteller instead of reading. I imagined someone reading the book to me as I silently follow the words with my eyes. Rowling has that magic touch. That's exactly how I felt when I read Harry Potter. The intricate details of the plot and the character build-up is commendable. It really helped me enhanced my imagination. It was actually kind of like playing a movie in my head. The characters were established really well. I like it that Cormoran was portrayed the war hero who is struggling to maintain a balance in his life after all that's he's been through. He's amputated. His girlfriend dumped him so he was forced to live in his office. He struggles to pay the rent of his office and he's oblivious to his father's money. As of this writing, Rowling has already finished the sequel for this series. I hope it gets released soon. This is a pseudonym for J.K. Rowling , the author of the Harry Potter series and The Casual Vacancy. Rowling's sister Dianne was born at their home when Rowling was 23 months old. The family moved to the nearby village Winterbourne when Rowling was four. She attended St Michael's Primary School, a school founded by abolitionist William Wilberforce and education reformer Hannah More. Her headmaster at St Michael's, Alfred Dunn, has been suggested as the inspiration for the Harry Potter headmaster Albus Dumbledore. As a child, Rowling often wrote fantasy stories, which she would usually then read to her sister. She recalls that: "I can still remember me telling her a story in which she fell down a rabbit hole and was fed strawberries by the rabbit family inside it. Certainly the first story I ever wrote down (when I was five or six) was about a rabbit called Rabbit. He got the measles and was visited by his friends, including a giant bee called Miss Bee." At the age of nine, Rowling moved to Church Cottage in the Gloucestershire village of Tutshill, close to Chepstow, Wales. When she was a young teenager, her great aunt, who Rowling said "taught classics and approved of a thirst for knowledge, even of a questionable kind," gave her a very old copy of Jessica Mitford's autobiography, Hons and Rebels. Mitford became Rowling's heroine, and Rowling subsequently read all of her books. Rowling has said of her teenage years, in an interview with The New Yorker, "I wasn’t particularly happy. I think it’s a dreadful time of life." She had a difficult homelife; her mother was ill and she had a difficult relationship with her father (she is no longer on speaking terms with him). She attended secondary school at Wyedean School and College, where her mother had worked as a technician in the science department. Rowling said of her adolescence, "Hermione [a bookish, know-it-all Harry Potter character] is loosely based on me. She's a caricature of me when I was eleven, which I'm not particularly proud of." Steve Eddy, who taught Rowling English when she first arrived, remembers her as "not exceptional" but "one of a group of girls who were bright, and quite good at English." Sean Harris, her best friend in the Upper Sixth owned a turquoise Ford Anglia, which she says inspired the one in her books.